Description: In the Fairyland Kingdom, Dark Queen wants to prove that she won't walk in her mother's footsteps, so she plans to get a spectacular new bold haircut. 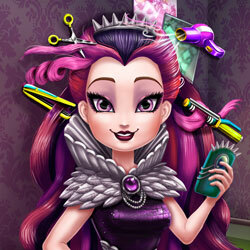 Help this rebellious royal reinvent her look by using the most glamorous colors to dye her hair. Cut, curl or magically make the hair grow back, then dress her up to add the finishing touches.